What kind of soap is in your shower right now? Ivory Body Wash and Dove Bar Soap (with the little nibblets in it). Do you have any watermelon in your refrigerator? No but I do have a Pomelo. What would you change about your living room? Hmm. Well, it's new so not much. Maybe some bookshelves. White or wheat bread? White. What is on top of your refrigerator? Tetley Tea Collectibles. How many plants are in your home? Eight relatively healthy ones. Is your bed made right now? Yes, always. Comet or Soft Scrub? Comet. I don't know what Soft Scrub is. Is your closet organized? Yes, I organized it yesterday. Can you describe your flashlight? I found it yesterday. It's electric blue. Do you have iced tea made in a pitcher right now? Nope. If you have a garage, is it cluttered? No, we had to de-clutter it to fit the car in. How many pillows do you sleep with? One, but I have more for decorative purposes. How often do you vacuum? Every second day. I'm anti-dirt. Standard toothbrush or electric? Electric. What color is your toothbrush? White and blue (I think). Is there anything under your bed? Maybe a lost sock or slipper. Chore you hate doing the most? Cleaning the bathroom. What retro items are in your home? I think my husband has some albums. Do you have a separate room that you use as an office? Yes, the third bedroom. How many mirrors are in your home? 6. That seems like a really high number! What color are your walls? Mostly some shade of beige. What does your home smell like right now? Coffee. I'm an addict (of coffee, I mean). What kind of pickles (if any) are in your refrigerator right now? Bread and Butter. What color is your favorite Bible? I have one bible. It's white. Ever been on your roof? No and I hate when anyone's up there. How many TVs do you have? 3. A big one and 2 smaller ones. How many house phones? 4 working. My husband seems to buy them just because they're on sale. Do you have a housekeeper? Oh, yeah. She's here at 7am everyday. I meet her in the mirror. What style do you decorate in? Sort of traditional contemporary. Is that a style? Do you like solid colors or prints in furniture? Solid, in the neutral tones. In case of fire, what are the items in your house which you’d grab if you only could make one quick trip? The photo albums. Give it a try yourselves! Good answers. What are nibblets and why are they in your soap? What kind of soap is in your shower right now? A soap made by my friend's son's girlfriend, it's got poppy seeds in it and it's better than a loufah. Do you have any watermelon in your refrigerator? No. What would you change about your living room? Make it bigger. Are the dishes in your dishwasher clean or dirty? Dirty right now. What is in your fridge? All the staples. What is on top of your refrigerator? Serving plates. What color or design is on your shower curtain? It's plain white. How many plants are in your home? Five. Comet or Soft Scrub? Both. Is your closet organized? Ha. Can you describe your flashlight? It's big and black and yellow. Do you drink out of glass or plastic most of the time at home? Glass. If you have a garage, is it cluttered? Yes. How often do you vacuum? When the dustbunnies come out to play. Standard toothbrush or electric? standard. Do you have a welcome mat on your front porch? yes. Is there anything under your bed? Those dustbunnies live there. Chore you hate doing the most? Cleaning the shower and ironing. Tied. Do you have a separate room that you use as an office? Yes. How many mirrors are in your home? three. What color are your walls? Eggshell in the living room; yellow in the kitchen; gold in the dining room; sea foam in the playroom. What kind of pickles (if any) are in your refrigerator right now? none. Ever been on your roof? No, but it's new! How many TVs do you have? four, but one doesn't count. It's an old black and white I bought in 1982. How many house phones? two. Do you have a housekeeper? used to. I miss Sylvia. What style do you decorate in? No style. Lots of them cobbled together. Do you like solid colors or prints in furniture? depends. Is there a smoke detector in your home? Four. In case of fire, what are the items in your house which you’d grab if you only could make one quick trip? Cats and photo albums. I love your answer for the house keeper...I have the same one, but she looks different! :) LOL! Hehe! Anti-dirt, I'll have to remember that! I did this meme the other day. Kookie- The nibblets are for exfoliating. I'm not sure what they're made of though! Karen- Great answers. I'd get the animals out of the house too. I thought that was a given. I don't want to look like an animal hater! Nyssaneala- Yes, it is a scent. I can't remember what candle company though. It smells like pumpkin pie- heavy on the cinnamon. And I definitely does not smell like my Grandma's house. 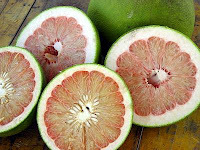 a pomelo? native to CB? great meme, and fun to read, so I did it too.